Forge Motorsport has long been associated with clever, ground breaking innovations, but the company’s latest design is one of the smartest ideas to appear onto the automotive aftermarket for quite some time; the Intake Press Compensation Valve (IPCV) – an idea so ingenious that we have patented it! Dump valves, Blow-off valves, call them what you will, but hopefully, we’re all reasonably familiar with the concept these components are a safe way of allowing excess boost to escape harmlessly when off-throttle, and holding the boost system tightly in check when mashing it into the carpet. Excess boost vents either to the atmosphere, with its familiar metallic sneeze, or for those that prefer their journey to sound a little more subtle, back to the low pressure side of the turbo circuit, depending on the type of valve you run.On cars with low or factory boost pressures, the spring or diaphragm inside these valves only has to be a fairly weak affair. This allows the valve to move quickly and freely, but with the downside that the valve is useless on a tuned or high-boost car. That lack of resistance simply won’t be able to keep the valve gas-tight as the boost pressure increases. For tuners, the solution to that problem has been simple for many years now, simply up the spring rate inside the valve (diaphragms tend not be up to the job on tuned vehicles) to allow it to cope with the higher internal pressures created by the tuning process. This keeps the valve shut under load, but with the downside that response time is reduced thanks to the spring being stiffer, and therefore physically harder to compress.The fitment of the stronger spring can also limit the opening of the valve which restricts the volume of air it can flow. For this reason, most quality valves come with either a choice of springs or some kind of internal pre-load adjustment, in order to allow the tuner or owner to set the internal spring pressure to match their boost settings. But this brings us onto to our next problem. Thanks to the plethora of sophisticated ECU software out there, these days, many cars also have some kind of easily-switchable throttle maps. On systems like EcuTek, where moving between throttle and boost maps can be as simple as clicking and flicking your cruise control switch, how on earth can a dump valve spring be perfectly set for your ‘everyday’ 1.0 bar map, but also work perfectly for your drag strip ‘all-out’ 1.4 bar mental mapping? Put simply, it can’t… so up until now, all dump valves had to be set to some sort of compromise to be a jack of all trades, and master of none. If only there was a way to make the dump valves spring operation completely independent of the spring pressure inside. A way to allow its function to work perfectly at any boost level. Clearly concerned by this very same problem, Forge’s technicians beavered away to find a solution. What they came up with is called the Intake Pressure Compensation Valve (or IPCV for short)… and it’s really rather clever. What makes the IPCV valve ingenious is that it re-routes the various high and low pressure feeds through a clever internal piston system (see diagram). When the throttle is opened and the car is accelerating, boost pressure generated by the turbocharger will ensure that whichever dump valve or recirculation valve you have fitted will be kept sealed. As no boost is now being lost through the intercooler (which can usually be anywhere between 1-3 psi of boost drop) the pressure acting on top of the piston of your dump valve is precisely equal to that underneath it. The result? Only a relatively weak spring is required to keep it operating, which means response times can be kept quick and throttle response is immediate. As dump valve springs usually have to compensate for the pressure drop across the intercooler, and this problem is now no longer an issue, the dump valve can now be run with a very weak spring. In fact, during testing, Forge Motorsport has actually been able to make this system work with no spring in the dump valve at all! When the throttle is snapped shut either to change gear, or on over-run, the vacuum created by the engine opens up the dump valve and allows the air to either recirculate back around the turbo (in the case of a recirculation valve) or straight back out to the atmosphere. Put simply, what these means, is that even on a fire-breathing 1200 bhp GT-R, the dump valves now only require a very weak spring to operate perfectly with no boost loss, allowing them to open more responsively on partial throttle, improving performance in every gear, and at whatever revs you care to use. Best of all, this principle works as well on a bone-stock Subaru WRX as it does on a Drag-spec Evo. Boost levels simply don’t affect this part of the equation any more. 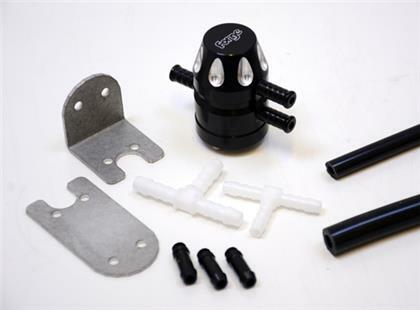 So if you want to know that your valve is always perfectly matched to your engine at all times without any spring changing or adjustment – just fit the Forge IPCV.